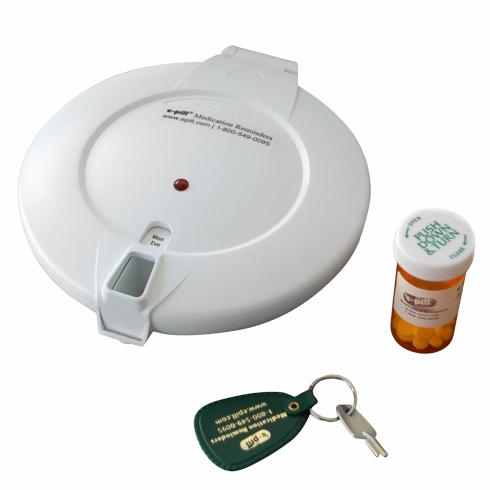 The e-pill MedTime XL is an Easy to Use Locked Automatic Pill Dispenser from e-pill Medication Reminders. When it is time to take your medications, the device will alarm, prompting the patient to turn the device over, dispensing medications into a cup or their hand. The original Made In Sweden pill dispenser remains popular after 18 years on the market. Documented cost savings of $5,400 per patient-year in-clinic use. How-It-Works: The pill dispenser will sound & pills will rotate into position. Lift up the device, turn the dispenser upside down to allow the pills to fall into your hand. All other medicine is inaccessible. The alarm stops by turning the device upside down (or after 60 minutes). This device is ideal for anyone on a complex medication schedule or for those who have difficulty with manual dexterity. Program & Load: Load the pills in the medication tray (two trays are included). Each tray has 28 compartments, each has a capacity equal to 15 Aspirins. For added capacity, you may set 2 or 3 alarms for the same time and double or triple the capacity. The early dose feature allows the patient to access medications up to 30 minutes before scheduled medication time. Capacity: Holds 15 Aspirin sized tablets per Dose. Max 28 Doses ('medication events') per Day.